Based on 3,000 total ratings, Slidermetrix gives Honda's "A New Truck to Love" and Jeep's "Portraits" top marks; Jublia brings up the rear. Viewers rated each ad on a second-by-second basis, moving the slider to the right when they liked what they saw and left during moments they didn't like as much. 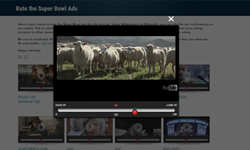 Ratings for 56 Super Bowl ads were conducted using Dialsmith’s Slidermetrix application, which allows viewers to continuously rate an ad as they view it using an on-screen slider with a scale from 0 (“Hate It!”) to 100 (“Love It!”). The average of each viewer’s slider position during every second of the ad results in a cumulative mean score for that ad, which determines each ad’s ranking in the report. Unlike other online ratings, Slidermetrix also identifies the highest rated and lowest rated seconds from each ad, helping to parse out key moments where an ad is particularly impactful or where it completely misses the mark. Budweiser’s “#GiveaDamn” and HEINZ’s “Weiner Stampede” received the most ratings, with 209 and 204 respectively. Budweiser’s choice to not continue the puppy storyline this year cost the brand significantly, dropping its overall rating from 70 in 2015 to 58.6 in 2016. This year’s empowerment ad from Mini USA, “#DefyLabels”, scored much lower at 50.2 than last year’s “Like a Girl” empowerment ad from Always at 62.5. Doritos’ ads during its last year of the “Crash the Super Bowl” contest rated similarly to last year’s winners, scoring in the mid- to upper-50s both years. Slidermetrix is a Software as a Service (SaaS) application that adds continuous, second-by-second rating capabilities to embedded online video. Through the Slidermetrix application, a fully customizable slider is added below a video, allowing viewers to continuously rate it as they watch. Real-time feedback is captured for display back to the viewer or for use in research and/or reporting. For online publishers, Slidermetrix creates a unique and interactive experience that increases viewer engagement and drives metrics for increased ad revenues. For marketing and media researchers, Slidermetrix offers a fast, cost- effective approach to market test recorded video content. To view a demo or request subscription information, please visit http://www.slidermetrix.com. Dialsmith is a Portland, Oregon-based technology company that develops products and services for research, audience engagement and live event scoring. We are pioneers in the development of tools for capturing and displaying continuous and moment-to-moment feedback and are the worldwide marketers, sellers and service providers for the Perception Analyzer, Perception Analyzer Online, ISX Scoring and Slidermetrix. Featured on CNN, FOX News, Food Network, ESPN X Games, The New York Times and more, Dialsmith’s Perception Analyzer tools are the gold standard for dial-based focus group testing, public opinion polling and audience engagement. To learn more, please visit http://www.dialsmith.com.